Check out this fully equipped stereo head unit receiver from Pyle! It's equipped with a dual-band radio (AM/FM), USB drive, and SD slot for digital music playback. Plus, you can hook up an external MP3 player using the front-panel 3.5mm aux jack. It's also got weatherband (WB) capabilities for realtime weather updates. Adjust the sound to your liking using the built in EQs, or adjust bass, treble, fader, and balance. Display shows minute and seconds. 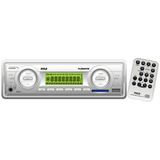 Store up to 30 radio station presets. This head unit pushes 40 watts on each of four channels for a total of 160 watts maximum. Includes a fully functional remote control.